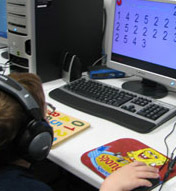 BrainTrain developed this computerized cognitive training system to improve an individual’s mental abilities in a wide variety of areas. The underlying training premise is that “practice makes perfect”. The Captain’s Log Program stimulates the areas of the brain that are responsible for learning abilities- attention, listening skills, self-control and memory.